Dissolved organic carbon (DOC) is an important organic pollutant in the air-water carbon cycle system, potentially influencing the global climate. In this study, 204 rainwater samples from five sampling stations in the Mt. Yulong region were synchronously collected from June to September in 2014. We comprehensively investigated the sources and wet deposition of DOC in summer precipitation. The average concentrations of DOC at five stations ranged from 0.74 to 1.31 mg L−1. The mass absorption efficiency (MAE) of rainwater DOC evaluated at 365 nm was 0.43 ± 0.32 m2 g−1. Backward trajectory analyses indicated that the southwest advection air parcel accounting for 46% of precipitation events, while the corresponding average concentration of rainwater DOC was 1.25 ± 0.56 mg C L−1. In addition to the local or regional contribution, large amount of atmospheric pollutants were transported from South Asia and Southeast Asia to the Mt. Yulong region, both of which had exerted great influence on the regional atmospheric environment. For the first time, the annual wet deposition of DOC in the Mt. Yulong region was estimated and determined to be 1.99 g C m−2 year−1. This is significant because the deposition of DOC on glaciers has great influence on surface albedo of snow and glacier melt. This study can bridge the gap of rainwater DOC research between the Mt. Yulong region and the southeast of Tibetan Plateau (TP), which has significant implications for better understanding the relationship of DOC deposition and glacial shrink in the TP. The online version of this article ( https://doi.org/10.1007/s10874-019-9385-8) contains supplementary material, which is available to authorized users. This work was supported by the National Natural Science Foundation of China (41601071, 41721091, 41630754). The independent program of SKLCS (SKLCS-ZZ-2018) and Key Research Program for Frontier Sciences of Chinese Academy of Sciences (QYZDJ-SSW-DQC039). The “Light of West China” Program (Y62992), and China Postdoctoral Science Foundation (2016 T90963, 2015 M582725). 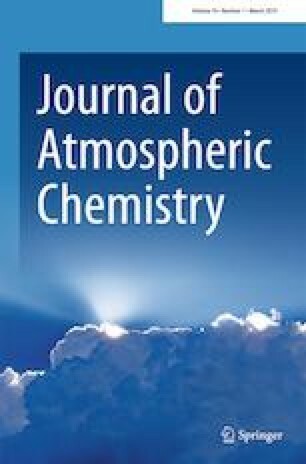 The authors gratefully acknowledge the NOAA Air Resources Laboratory (ARL) for the provision of the HYSPLIT transport model and/or READY website (http://ready.arl.noaa.gov) used in this publication. We also express our sincere appreciations to Editor-in-Chief Elliot L. Atlas, and another anonymous reviewer for their constructive comments on our paper.